I recently received a new cookbook – ‘Thrive Foods’ by Brandon Brazier. He is a professional Ironman Triathlete who has developed the Vega Optimized Meal Replacement that I have been using for quite some time now. It uses non-animal based protein sources and adds in everything from your daily multivitamin, complete set of essential amino acids, berry complex, chlorella, etc. all in an alkaline base to allow your body to absorb the nutrients more fully. Since taking it, my skin has become softer, my nails have grown stronger and I just feel much better. I figured he must be “on” to something and so today I attempted a few of the recipes in his cookbook. I’ve been trying to spend some time on the weekend to prep all my vegetables and fruits for the week and pack everything up in single servings so that I can grab and go during the week. 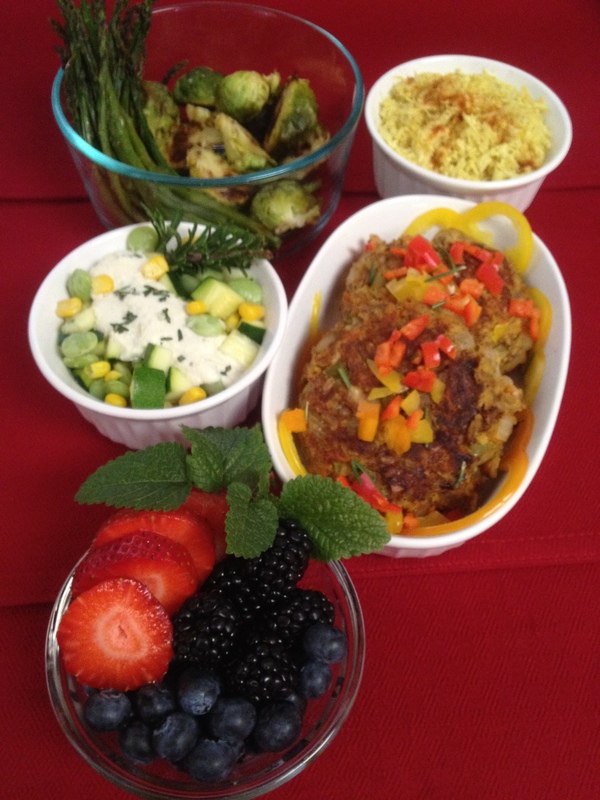 Clockwise from the top we have roasted asparagus and Brussels sprouts, Cauliflower “Rice,” Red Lentil Patties, assorted fresh berries, Summer Succotash with Garlic Rosemary Sauce. All of these dishes are Vegan, dairy-free, gluten-free, and full of freshness and flavor. The easiest of all was the Cauliflower “Rice” – shredded cauliflower (about 2/3of a medium sized head of cauliflower using a medium sized grater) is put in a bowl and tossed with a couple teaspoons of curry powder and some sea salt. It’s then fried in a skillet for about 5 minutes with a little bit of melted coconut oil. It tastes wonderful, and makes a great mock grain to go with the homemade lentil patties! Brendan has done well with that one! What are your favorite veggies dishes? Post in the comments section below. If you want any of the recipes, you can post that in the comments section as well. I think I’m going to enjoy this book! Ohhhh my lordie! Is this ever good! No boos around the dinner table for you (if you can get past the whole green thing)!! Your friends will be positively green with envy at your culinary skills! Ramp up the scary and put some roasted fingerling potatoes in the bowl before serving! They look just like scary fingers emerging from the goo! Seriously, this is a fun stew that tastes similar to a Thai green chili base. It is so flavorful. I got the recipe when I attended a recent cooking demonstration at Native Foods given by Chef Tanya Petrovna. She shows you how to have fun and flavor that is beyond measure. One of my favorite restaurants! I haven’t had much experience with Thai cooking and I was surprised at how easy it was to recreate those flavors at home with her recipe. Soul satisfying green goo! Try to use organic products wherever you can. Be good to you. In a small skillet (no oil) hit the coriander, cumin and whole black pepper to toast slightly. Grind the freshly roasted spices with a mortar and pestle (get creative with a meat tenderizer or something if you don’t have a mortar/pestle). Add the salt, jalapenos, cilantro, lemongrass, green onions, ginger, lime juice, zest and continue to mash the mix with the mortar and pestle until it becomes a paste. Set aside. This makes enough paste for a couple of batches of the stew. You can freeze half of the paste for use another day. 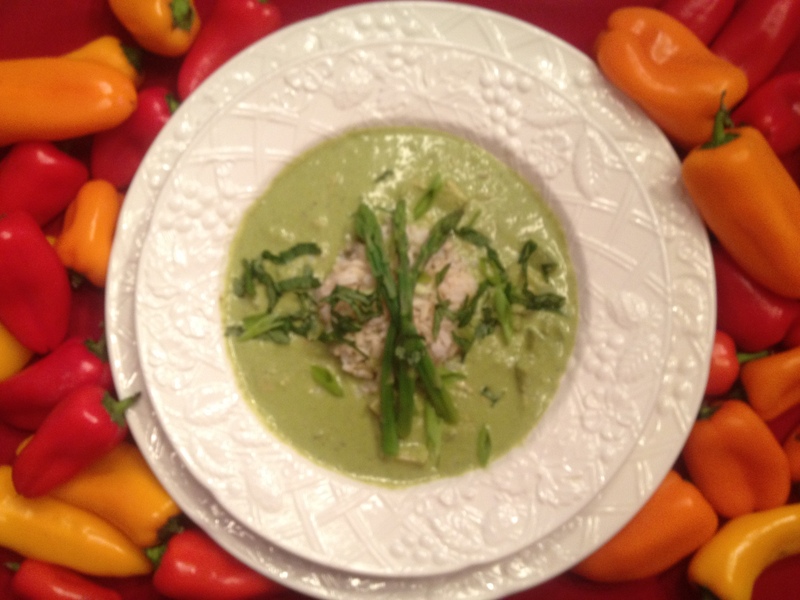 In a blender put in 6 Tablespoons of the paste, 1 cup chopped spinach, and one can of the coconut milk and puree. In a stock pot, pour in the spinach coconut milk puree, the second can of coconut milks, water, zucchini, green beans, tofu, and cashews and simmer for 10 minutes. Add the maple syrup, soy sauce, and sea salt and simmer for another 5 minutes. I pureed a few cups of the goo, then added it back to the pot to thicken it up a bit. Serve over a little rice or pasta and garnish with fresh basil and lime wedges…..and maybe those roasted fingerling potato “fingers”……Boo! Get creative! Any green veggies will do in the goo! Tags: cravings, food, healing, organic, recipe, stew, Tofu, Vegan, Vegetarian, YUMMY! Categories : cravings, food, healing, JOY!, love, Organic, recipe, tofu, Vegan, Vegetarian, Yummy! What always makes you feel better? A bowl of hot soup, no? How can you make this in a vegetarian format while maintaining all the flavor? 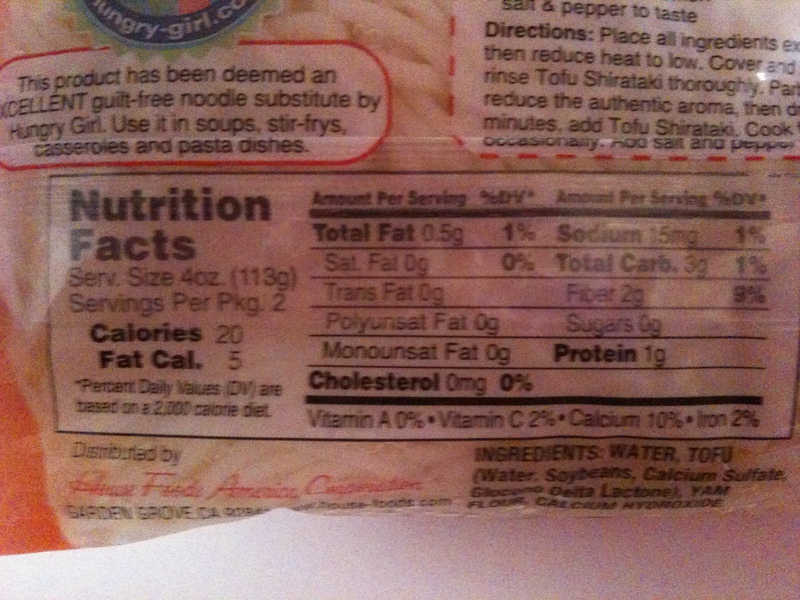 Why, with my latest discovery….Shirataki noodles….of course! They are tofu based, but they look, taste and feel like pasta. They are low carb, low-calorie, sugar fee, gluten-free miracles! You can find them in next to the tofu in the refrigerator section. They may not be in all grocery stores yet, but you can find them in your natural stores for sure. Heat oil in a large soup pan and sauté the mirepoix (carrots, celery and onions) for 3 to 4 minutes until veggies are just barely beginning to brown on the edges. Add water and bring to a boil. Simmer, covered, for about 15 minutes or until vegetables are tender. 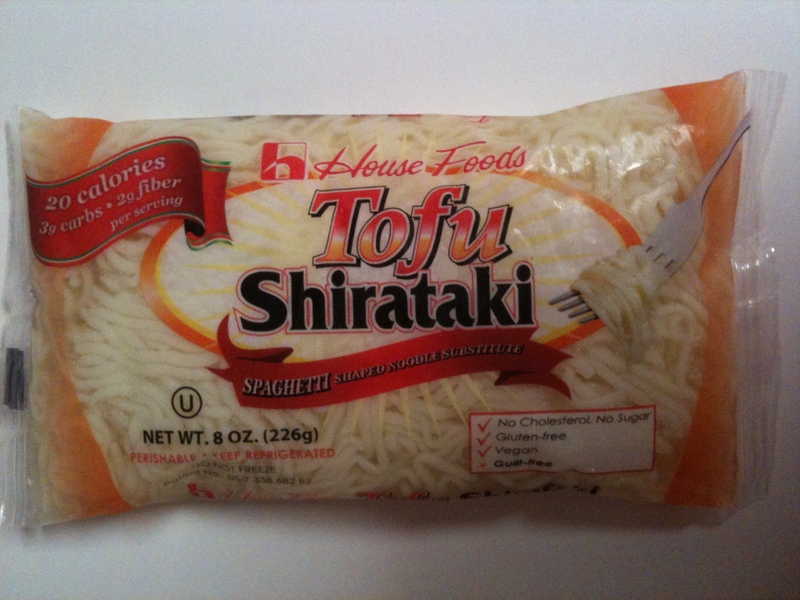 While waiting for the soup, empty a bag of shirataki noodles into a strainer and rinse thoroughly. As the bag I used stated, “to reduce the authentic aroma.” A statement like this and you know I’m going to be encouraged to sniff, of course, and all I can say is learn from the error of my ways! You should rinse the noodles thoroughly! Drain them well! 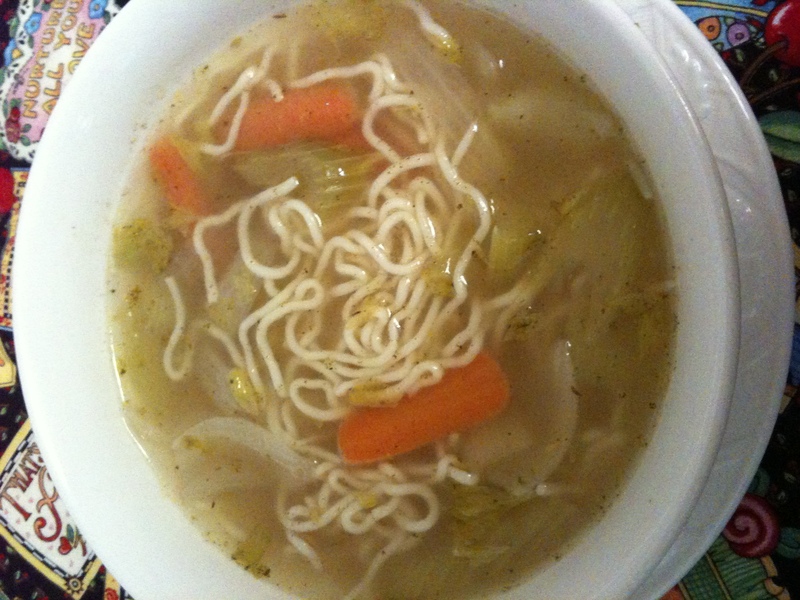 When the stock is ready, add the noodles, give it a quick stir, and boil for about 3 minutes more. Check for flavor and adjust seasonings as necessary. 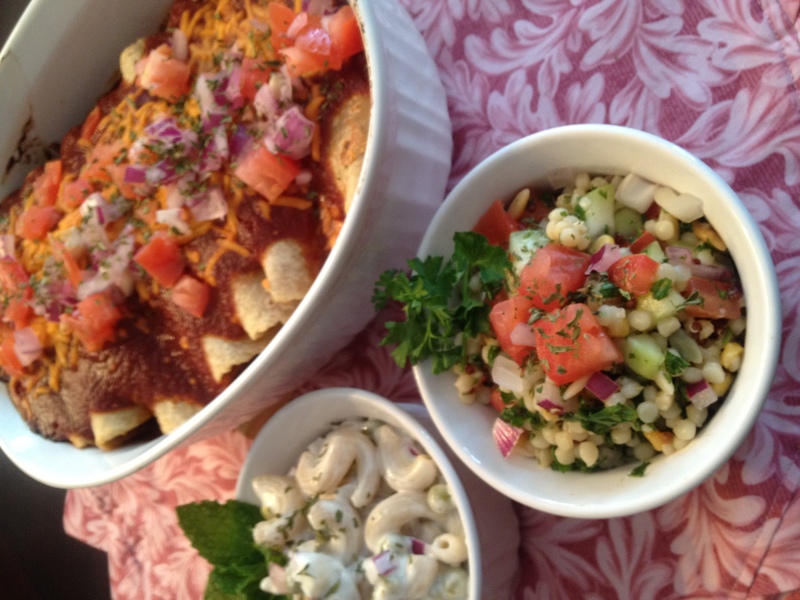 Portion into bowls, include a side of crusty bread, a little salad, or cornbread and then eat and enjoy! Mmmmm! Just what Docktah Mom ordered! Enjoy!